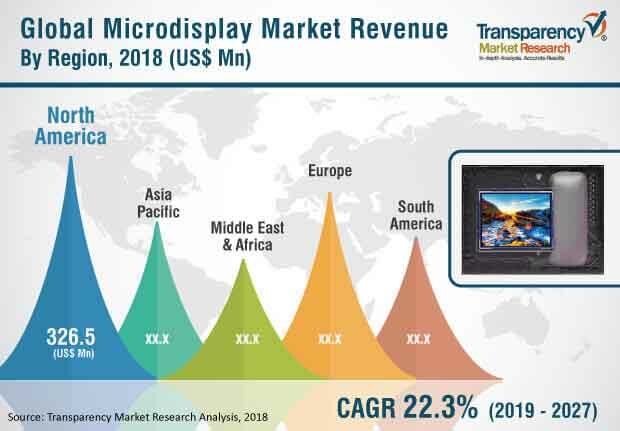 According to a new research report on the global microdisplay market published by Transparency Market Research (TMR) the global microdisplay market is expected to reach value of US$ 5782.6 Mn by 2027, expanding at a CAGR of 22.3% from 2019 to 2027. According to the report, the global market is likely to continue to be influenced by a range of macroeconomic and market-specific factors in the next few years. In terms of demand, Asia Pacific is projected to continue to lead the global market, with the market in the region expanding at a CAGR of 24.8% between 2019 and 2027. The global microdisplay market has witnessed strong growth over the last decade. One of the major drivers propelling the market is advantages associated with the use of microdisplays. Some of the significant features of microdisplay are high resolution and excellent image quality, low power consumption, and compact size. Generally, microdisplays are less than two inches in diagonal. In other words, their diagonal is approximately five centimeters. In addition, high-resolution microdisplays offer excellent viewing experience to users, which results in the increasing popularity of high-resolution display devices. These features allow the deployment of microdisplays in multiple applications ranging from consumer electronics to military, defense and aerospace. This, in turn, results in increasing popularity of microdisplays among manufacturers. This factor is likely to propel the global microdisplay market during the forecast period. The global microdisplay market has been broadly segmented in terms of type, projection type, technology, end-use industry, and region. Based on type, the market has been segmented into reflective and transmissive. The transmissive segment was dominant, holding more than 50% share of the global market, in terms of revenue, in 2018. This can be attributed to the increasing penetration of LCoS and LCD technologies that the transmissive segment comprises. Furthermore, the segment is expected to expand at a significant CAGR of 21.3% during the forecast period. Growth of the transmissive segment is attributable to the large number of applications of transmissive microdisplays, which include near-to-eye displays (NEDs). In terms of projection type, the global microdisplay market has been divided into projection and near-to-eye displays. The near-to-eye displays (NEDs) segment is expected to expand at a high CAGR of 25.7% from 2019 to 2027, due to rising consumer inclination toward NED devices such as head-mounted displays and head-up displays. Based on technology, the market has been segmented into liquid crystal on silicon (LCoS), liquid crystal displays (LCDs), digital light processing (DLP), organic light-emitting diodes (OLEDs), and others. The OLEDs segment is anticipated to register the maximum CAGR of 25.3% during the forecast period. OLED displays are gradually replacing LCD displays in various devices including smart phones, smart watches, and television sets. This is primarily due to superior features of OLED displays compared to LCD displays such as wide viewing angles, large color gamut, and low power consumption. Based on end-use industry, the microdisplay market has been segregated into consumer electronics, health care, military, defense and aerospace, automotive, sports & entertainment, retail & hospitality, industrial, and others. The military, defense and aerospace segment is anticipated to dominate the global market during the forecast period. It held the maximum i.e. 29.80% of the market share in 2018. Geographically, the global microdisplay market can be segmented into North America, Europe, Asia Pacific, Middle East & Africa, and South America. Among regions, North America is anticipated to hold the maximum share of the global market, while the market in Asia Pacific is anticipated to expand at the maximum CAGR during the forecast period. In 2018, North America accounted for 34.37% share of the global microdisplay market. This is attributable to early adoption of technologies and increasing adoption of microdisplays in the consumer electronics sector. Furthermore, the market in Asia Pacific is anticipated to expand at a high pace between 2019 and 2027, due to presence of leading players such as LG Display Co. Ltd., and Sony Corporation in the region. The research study includes profiles of leading companies operating in the global microdisplay market. Market players have been profiled in terms of attributes such as company overview, financial overview, business strategies, and recent developments. Some of the prominent players operating in the global market are AU Optronics Corp, eMagin Corporation, Himax Technology Inc., KopIn Corporation Inc., LG Display Co. Ltd, Microvision Inc., Omnivision Technologies, Inc., Sony Corporation, Syndiant Inc., and Universal Display Corporation. Companies are focusing on expanding their business through strategic acquisitions and partnerships.